Eradicating Bed Bugs for Over 15 Years. Think you may have bed bugs? 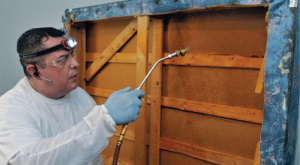 Have you discovered a bedbug infestation in you residential or commercial dwelling? At Freedom Pest Control, we are experts at eliminating your bed bug problem, guaranteed. 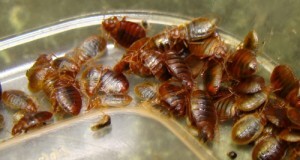 We have discreetly helped hundreds of bed bug victims just like you to finally eradicate these pesky pests. If you feel you may have been infiltrated, contact us, the leading Bed Bug Exterminators in New York, New Jersey, Long Island, and Connecticut. See our bed bug canine detection service and Tre, our bed bug detection team member in action. Bed bugs are attracted to carbon dioxide, which is produced by humans, warmth and human scent. The insect bites by piercing the skin of its host with the use of two tiny hollow tubes. It then injects its saliva, which contains powerful anesthetics and anticoagulants to numb the area and water down the blood for feeding. The bed bug then begins to extract a blood meal. The bed bug feeding process can take anywhere from 3 to 10 minutes and after it’s done, it quickly returns to its place as bed bugs are not known to be as sociable as ants. It’s also important to note that adult bed bugs can live as long as 18 months without feeding. However, younger insects, such as instar nymphs, should eat within the first 30 days of their life in order to survive. Some nymphs can survive longer, but not 12 to 18 months as adults can. Never treat a bud-bug infestation with BOMBING or FOGGING!!!. They will simply hide in areas they normally would not, spreading the problem. Bed Bugs are very small; adults are no bigger than an eraser head on a pencil. Adult Bed Bugs can live well over a year with a meal. 1st instar nymphs can not. (Between a few days and 90 days) This is based on our studies. (Freedom Pest Control). Why the resurgence? Travel, secondhand furniture, pest control practices, the list goes on. What is important is that they are here and they don’t discriminate. Bed Bugs do have a preference of who they bite in the home, reasons unknown at this time. Treatment is highly recommended by a specialists in the field, over the counter products are available for do it yourself but we strongly advised you, despite what you may have read on the internet, do not BOMB! NO BOMBING, NO FOGGING!! !